I may have jumped on the Netbook bandwagon a little early, as these low-cost mini-notebooks are about to get a whole lot better. Especially in terms of video playback. Intel has released a new version of its Netbook-friendly Atom chip, which although only bumps the speed up slightly, is being paired with the company’s new GN40 chipset, whose graphics capabilities includes hardware-based 720p HD video decoding. The current range of Netbook have no problems playing back lower quality YouTube content and standard definition DivX movies but really struggle with higher definition content. 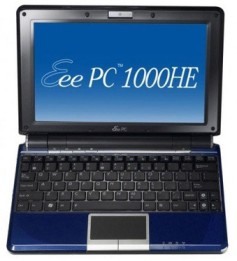 So Intel’s new offering, first seen in the new Asus Eee PC 1000HE, makes Netbooks a much more viable media player. Not content with 720p video playback on your Netbook, then you may want to hold out for future offerings based on Nvidia’s rival Ion platform with all its hardware-based 1080p decoding goodness. Watch this space. I gotta say, I had a great experience streaming the CBS coverage of the inauguration in HD on my ASUS 1000H. Crystal clear. That’s interesting. My MSI Wind (rebadged as an Advent) can’t handle the 720p HD content shot on my camcorder. I’m hoping the new chipset will address that.